Renan Barao will finally get another crack at T.J. Diallashaw (pictured), the man who upset him for his UFC bantamweight title in May – assuming, of course, Barao can make weight this time around. On Saturday, it was announced the two will headline UFC 186. The April 25 event goes down inside Bell Centre in Montreal, Quebec, Canada. 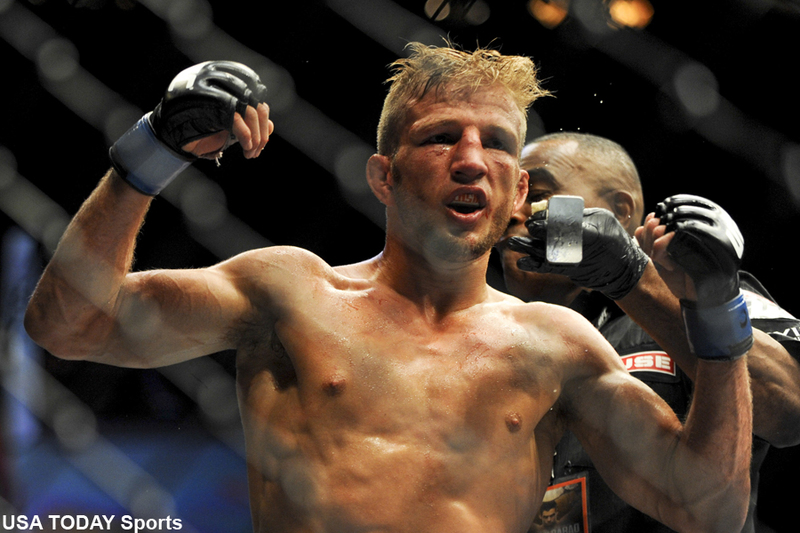 Despite being a whopping 8-1 odds-on favorite to blast Dillashaw in their initial encounter at UFC 173, Dillashaw came out of nowhere to dominate the Brazilian. Barao was granted an immediate rematch to reclaim his throne at UFC 177, but he was forced to withdraw just 24 hours before showtime after his body failed trying to make weight. Dillashaw went on to knockout poor Joe Sotto that August evening. Barao returned to action last month by submitting Mitch Gagnon. He hit 136 pounds on the scale for that bout without issue.